The firefighters continued breaking a path ahead. CJ and Bill retreated, and once back in the safety of the open yard, were busily knocking more roaches off each other. The bugs were in every growth stage and I want to say, there were LOTS of them, scrambling about through their clothes, inside CJ’s blouse, and some tangling into her long locks. CJ was freaking out, just shy of full-blown hysterics. Bill began to pull his socks up, over the cuffs of his trousers, to prevent any bugs from crawling up his legs when they went back into the house. He advised CJ to do the same. He gave her a minute to calm down and compose herself, then they moved to the porch. I noticed a pile of junk on the porch bench. Hey! There were fresh oranges and a bunch of greenish-yellow bananas setting atop the day’s edition of the paper. Huh! I thought, this must be the safe place to keep the produce at this house. On the porch! The firemen met them in the ‘tunnel’ which led to the kitchen. There lay the woman, face-down on the floor in front of the stove. There were several cans of Ajax powder around the counters and on top of yet more piles of refuse. 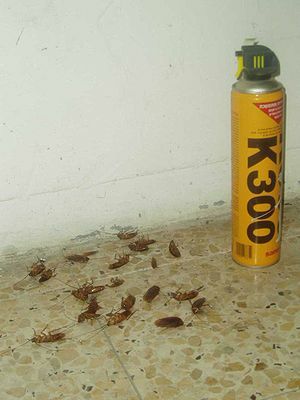 I could see half a dozen cans of aerosol roach killer, some on the floor, some laying on their sides, scattered willy-nilly about the place. A wonder a fire had not claimed her before now, really. Darkness had fallen and the beams of light from the flashlights were all the light we had in the house now. The deputy was correct in his assumption—no way was that gurney going to make it through this mess! However…just a few more feet past the dead woman, like manna from heaven, stood the back door! One of the men pushed and pulled until it opened. The incredible stench of putrescine¹ and cadaverine² were overtaking all of us; Bill was gagging and clamoring to get outdoors. I was not feeling so great myself. However, where could I go? Yes, indeed, I would remember this! NEXT time I believed I’d just be a mouse and stay safely inside my quarters, minding my business! For the time being, I would have to suffer silently in the pocket — a just punishment. CJ was holding her collar flap over her nose as she bent over the woman on the floor; in the darkness she thought she saw a wristwatch on the left wrist. She picked up the lady’s hand as the flashlight beam shone down. YIKES! It wasn’t a wristwatch! A host of roaches scattered in every direction — they had been feasting on the arm, encircling the wrist, causing a ring of open flesh there. Rigor mortis had come and gone; as they rolled the body over, advancing decomposition was evident around the belly, judging from the greenish-black color of the skin there. The skin had begun to ‘slip³’ as well. Liquid purge issued from the mouth and nose. It was such a typical scene, though, when a body has lain dead for a couple of days, especially with the heat. Ugh! As CJ and Bill worked to stifle their gag reflexes, they slipped the linen sheet around the woman, tying knots at either end. This enabled them to carry the heavy body with ‘handles.’ The firefighters had cleared a path out the door to the back of the house. Bill ran around to retrieve the gurney. I noticed that, just beyond the rear walkway, in the yard, stood a card table, on which there were lined up very neatly. 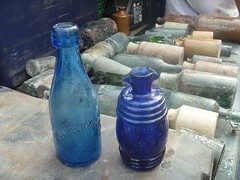 Antiquities of many types, were all in neatly organized areas, in the back lot. Incredible! Without much waiting, the coroner investigator arrived, did a quick evaluation, and decided she would sign off on this one. It looked like a ‘natural’ death by her estimation. She said she would forward the documentation to headquarters after she called the woman’s physician in the morning. With that, the woman was loaded and we set off to drive back home, finally. CJ and Bill discussed the incredible clutter and talked about what they were going to need to do once they got the woman back to the mortuary, such as notifying the husband. I thought about the fact that the estranged husband had moved to the eastern seaboard. I thought to myself, a very smart move! Three thousand miles seemed to be a good enough distance from that house…sadly. I would be spending the night away from my nest. They were planning a major spray-down and fumigation when they took her into the prep room. The poisons would be deadly. I could only hope that none of those odious roaches would survive. I knew I wouldn’t get a wink of sleep that night, even upstairs in the parlor fireplace hole. It would be tricky just making my way to it; Chester would be sleeping nearby, and worse, those guillotines with the unmerciful jaws were placed like landmines along the baseboards I had to run to reach the hole. CJ’s night was going to be one of little sleep, too. She detested roaches. No doubt, there would be signs of maggots, too, by morning. Poor girl! What a creepy end to an otherwise perfect summer day! ¹Putrescine, or tetramethylenediamine, is a foul-smelling organic chemical compound by the breakdown of amino acids in living and dead organisms. ²Cadaverine, (literally “essence of dead cadavers”) or pentamethylenediamine, is a foul-smelling diamine compound produced during putrefaction of animal tissue. Cadaverine is responsible for urine odor in the living.³ Skin slip, or loosening of the skin, is a natural part of decomposition after death. This entry was posted on June 20, 2013 at 5:16 am and is filed under Death, Mortuary with tags dead body, decomposition, hoarder, post mortem. You can follow any responses to this entry through the RSS 2.0 feed. You can leave a response, or trackback from your own site. Very well written, thank you for sharing. Although I was spellbound reading this, I would not want to be there in person. Over thirty years ago, I made home visits as a welfare examiner. I entered a few hoarder’s homes, but the word ‘hoarder’ was not yet used. We just thought they were sloppy and didn’t clean their house. OMG girl! “Sloppy” just doesn’t come close for this one, lol! It was TOUGH getting into that place and once inside almost impossible to get out..I’ve never been a claustrophobe but dang, this one coulda done it for me! BTW, thank you kindly for the compliment. I meant to put that first, BEFORE my reply…where are my manners? Oh! That’s right! They are non-existent without a cup of joe..and because I just remembered I ran out of creamer, no joe..I am so spoiled! Sheesh! LOL! Thanks so much for coming back to read my posts. Me too! I nearly allowed for Morguie to go ahead and come out of the pocket and explore the house on his own, in that story. I might have left him in that place to fend for himself…I am glad I decided to have the fire truck show up at that point, lol! This experience happened before I ever knew of the word ‘hoarder’ and it was so shocking to see the incredible collection of mostly garbage in that house. I’d NEVER witnessed anything so…’solid’ as the volume of contents that were compacted up to the ceiling, in every room. Plus horrendous vermin, ugh! It was unlike anything I’d ever known before or SINCE. It was also the first time I saw a petrified orange…solid as a rock, not kidding! I saw pets like cats… that had died many years before being discovered underneath the debris… hoarding is a scary thing…. a person’s mind ….